Note: Included here are a few additional buildings east of downtown including the Collegiate Gothic style Central High School and Eastlake Style home at 535 Fountain NE. Peninsular Club. Date: 1913. Design: Architects Robinson & Campau designed a five-story building of fireproof steel construction with a facade of red brick and gray terra cotta trim. The interior was designed by L.O. Robertson of the Tobey Furniture Company of Chicago. Interestingly the building had 15 bedrooms with baths plus a barber shop for use by members and visitors. It also was filled with offices, dining, reading and lounging rooms, billiard handball court and card room. History: The "Pen Club" was a private club with members counting among the most promInent of the city. The club began in 1881. The current building replaced the original demolished to make place for the new. The club sold its building in 2004, moved out in 2008 and closed in 2010. Today: The building is owned and restored by RDV who purchased it in 2004. 48 Fountain on the left in the photo. Date: 1910. Design details and history coming soon. Klingman Exhibition Building. Date: 1904 Design: Design: W. G. Robinson and F. S. Robinson in the Chicago modern commercial style. Additional exhibition space for Dudley Waters and Philip Klingman. Today: Kent County offices. Steketee's Wholesale Building. Date: 1908. Design: Robinson & Campau for Stekete''s wholesale drygoods business. History: In 1899, Steketee's acquired the entire corner at Fountain and Ionia. and built in 1906, a modern four-story building there which becme their wholesale operation. In 1913, a forth floor was added. By 1931, the wholesale business was phased out. Today: Commercial Building. Michigan Bell Telephone Company. Date: 1924. Design: Wirt Rowland, Architect, Smith, Hinchman & Grylls, of Detroit. Similar design to other Telephone Companies designed by the firm around Michigan. 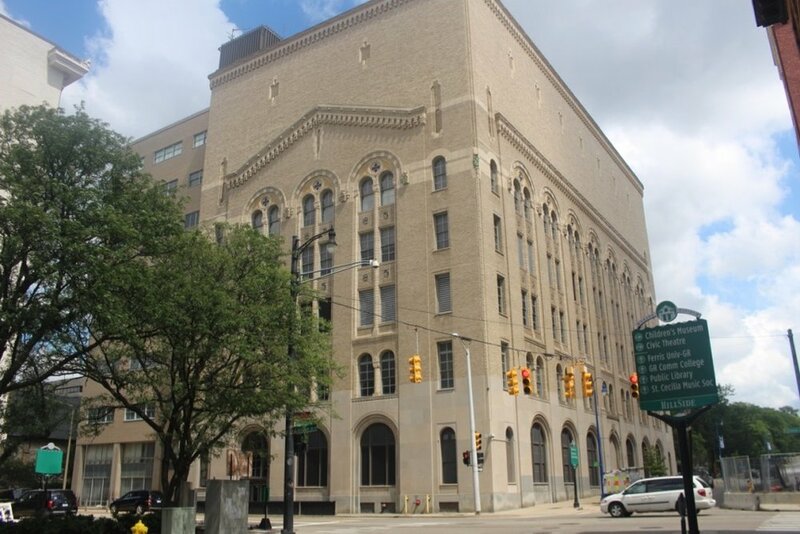 According to the book Designing Detroit by Michael G. Smith, the building is "understated, with subtle decorative embellishment." The limestone base is topped with buff-colored brick and pattered brick with terra-cotta trim. Tall rounded Romanesque arches add drama on the first level, and the paired arched windows, within the spandrels, were designed with decorative shields and accents of pale blue, green and yellow. The impact and beauty of Rowland's design has been dulled with the addition of squared off upper floors above the original decorative cornice over the fifth floor. History: It was once the central offices and company headquarters, and home to banks of long-distance operators. Today: Owned by AT&T. Keeler Building. Date: 1914. Design: Brick structure with terra cotta tile trim designed by Osgood and Osgood in the Chicago style. History: It opened to house showrooms for the furniture industry for the twice yearly expositions that drew thousands of furniture buyers nationwide including Baker Furniture company, Herman Miller and Kindel Companies. 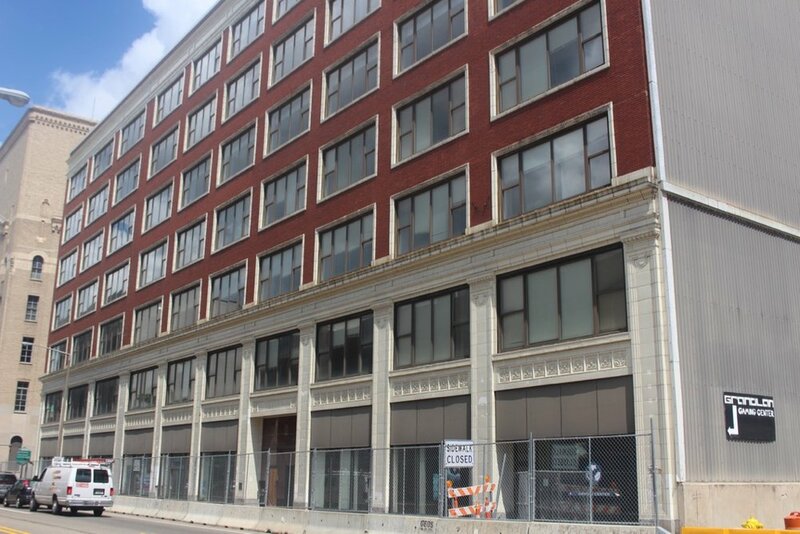 Today: The Keeler Building was added to the National Register of Historic Buildings in 1980 but is currently vacant. George A. Davis Vocational and Technical School. Date: 1922. Design: Williamson & Crow designed this modern school building which later was incorporated into Grand Rapids Junior College, then Grand Rapids Community College. Today: Main Administration Building, Grand Rapids Community College. Fountain Street Church. Date: 1924. Design: The original church burned in 1917 and the current massive Romanesque church was completed at the corner of Fountain and Bostwick. It was designed by Boston architects Coolidge and Hodgdon. A chapel designed by renowned Michigan architect Alden Dow was added in 1951. History: The church has been the site of cultural programs, community events and political assemblies. Today: Fountain Street Church. Temple Emanuel. Date: 1882. Design: Gothic style by Grand Rapids architect David S. Hopkins. Featured Tiffany glass window added in 1926 and moved in 1952 to the new modern Temple Emanuel building designed by Eric Mendelsohn on East Fulton. History: According to Wikipedia, the original Temple building at Fountain and Ransom is the oldest Temple building in the United States still in use. Today: Spectrum Theatre, Grand Rapids Community College. Hoffman Apartments. Date: 1904. Design: Seven-story brick and stone apartment building designed by F. P. Allen & Son for Clayton Hoffman as 12 suites with seven rooms each. Today: Park Place Apartments. Davis House. Date: 1881, 1886. Design: Sidney J. Osgood and David S. Hopkins redesigned the original Hibbard Home as an fine example of Eastlake styling with Carpenter Gothic details. the house features ornate fretwork to complement the steep gables and stained glass windows from the Wells Company in Chicago. There had been an elaborate Porte-Cochere torn down to make way for the automobile. Turned wood pieces were completed at the Stow-Davis Furniture Company where the owner George A. Davis eventually became president. History: The home has great historical integrity as it stayed in the Davis family for 115 years. 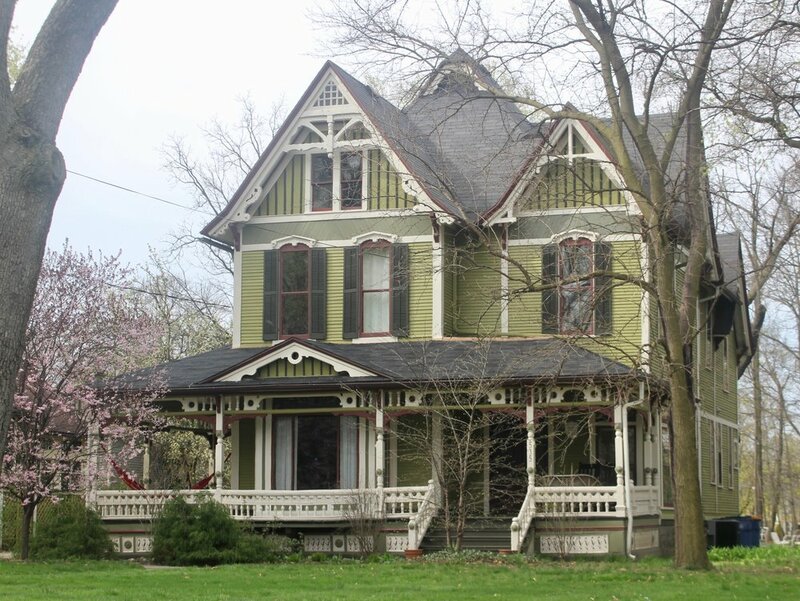 Today: The house has changed hands several times but remains a premier example of Grand Rapids legacy of historic homes. Central High School. Date: 1911. Design: Architects Robinson & Campau working in collaboration with Detroit and St. Louis school architects, designed this Collegiate Gothic building, constructed of red paving brick, gray terra cotta and cut stone trim. Original multi-paned windows have been replaced. History: Central High School had three other locations before the current building at 421 Fountain. The principal of the high school, Dr. Jesse B. Davis is said to have designed the school's interior. Dr. Davis led the move to open Grand Rapids Community College, the first two-year college in Michigan. Today: The school is still in use and has been a registered historic landmark site since 1922. Preferred Insurance Company. Date: 1959. Design: Architectects Skidmore, Owings & Merrill, Chicago and Contractors Owen-Ames Kimball, Grand Rapids. The illustration was used in an advertisement in the Penninsular Club Magazine dated December, 1959. Located next door to the Penn Club Building at the corner of Ottawa and Fountain, the six-story building of "luminous" stainless steel and "sparkling" plate glass was called "a refreshing departure." The building featured hIgh-speed elevators, the finest new "weather-master" air-conditioning system and a "pleasant, comfortable and stimulating" interior design. History: The modern exterior was replaced during a complete renovation of the building. Today: RDV Corporation.